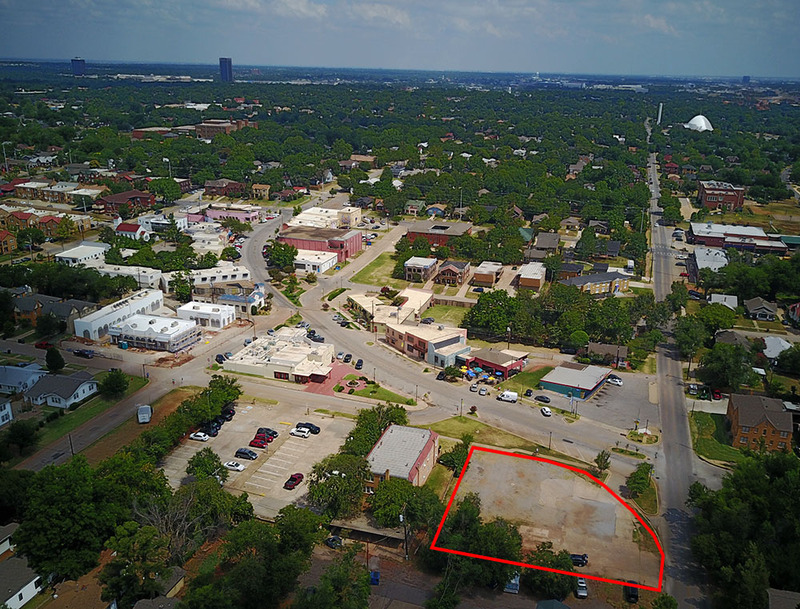 Work is set to start soon on Frida, a new restaurant and bar to be constructed on a vacant lot at the south edge of the Paseo Arts District. The proprietor is Shaun Fiaccone of Humankind Hospitality Service which also operates Picasso Cafe and The Other Room in the Paseo. The design by Brian Fitzsimmons features modern Spanish Revival architecture to complement the surrounding structures and includes 4,386 square of enclosed space along with a 698 square foot outdoor courtyard sheltered by a trellis and 989 square feet of outdoor patio. Fitzsimmons Architects has designed some of Oklahoma City's more stunning restaurants, such as Hatch, Broadway 10 and both Sidecar locations. The name Frida is an homage to Frida Kahlo the Mexican painter. The restaurant layout highly favors an outdoor orientation, either looking out through large windows and doors or seating space on patios and courtyards facing both east and north. The entire project looks out about the Paseo District. Fiaccone is developing the menu with the help of chef Ryan Parrott which will be new American with a strong Southwest influence. Everything will be made from scratch and locally sourced where possible. A full bar will be offered in the restaurant and the separate bar, The Daley, will feature an overhead door that opens to its own patio. In contrast to the bright, airy spaces of Frida, The Daley will be darker and more intimate and focus on whiskey and craft cocktails. 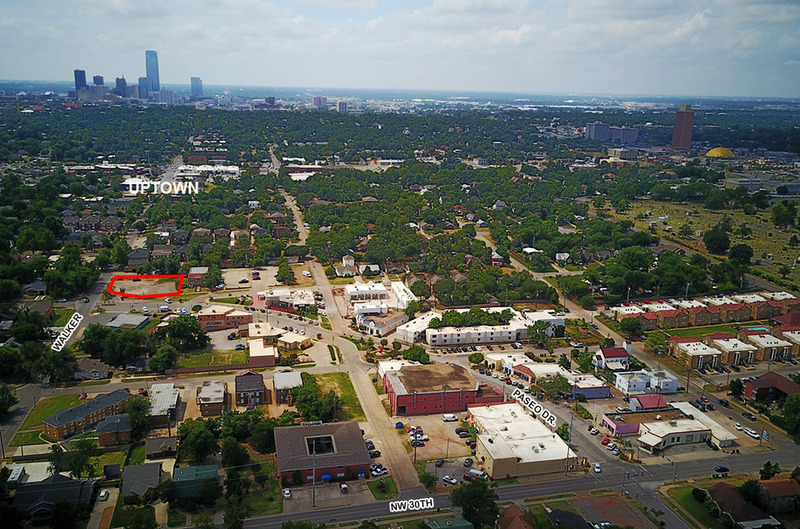 Frida is to be constructed on a large vacant lot at the southern edge of the Paseo and will help to bridge the district with the booming Uptown / 23rd Street area, as the distance is only four blocks from the popular Pump Bar, which is directly south on Walker. Originally proposed as Via Paseo, the re-worked project has room along Walker for future commercial expansion. The plans will be reviewed in the September meeting of the Urban Design Commission. This looks like it is going to be awesome. I do have mixed feelings about Via Paseo being redone though. We're losing out on nearly 4k sq. ft. of retail it looks like. Via Paseo would have been that ENTIRE empty lot though, right? Whereas this leaves area just southeast open for development, correct? So, there's potential for this entire block to be even bigger than the original Via Paseo design? Either way, this restaurant looks gorgeous and will be massive hit once open, no doubt. 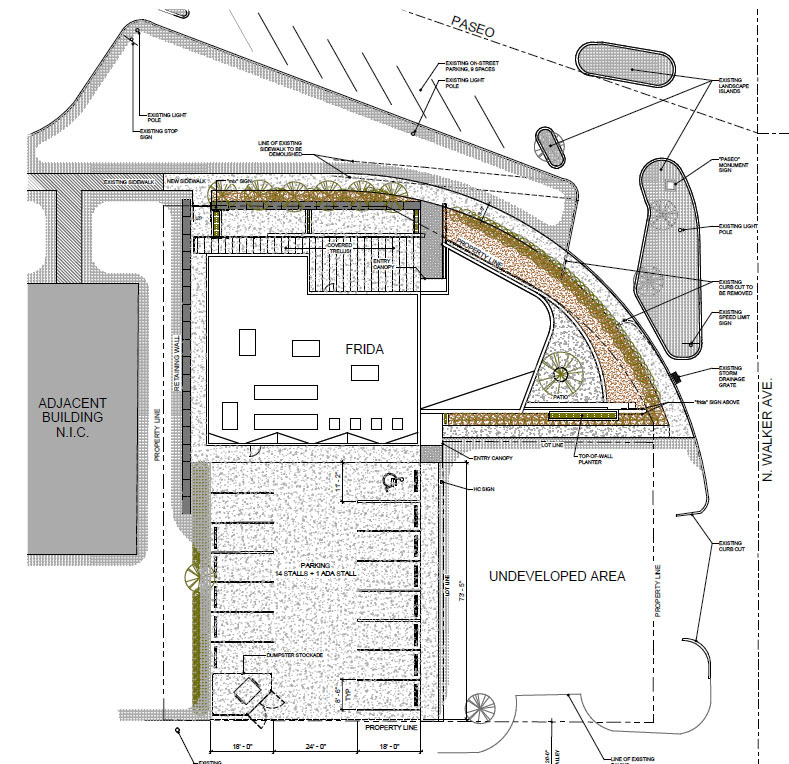 The "undeveloped area" in the site plan above will ultimately be built out as office / retail space. I love this! The only question I have is will this affect parking when it comes to the First Friday events and lets say the Paseo Arts Festival! Is there anyway for the area to solve the whole parking issue because it does get very busy? For the Paseo Arts Festival, I usually park north of 30th on the side streets between Shartel and Walker. This year, I tried parking at the SE corner of 32nd & Dewey, and there was a guy there selling $10 dollar parking in the small apartment building on the corner. There were 3 free spaces available in the street, but this guy had nailed homemade cardboard "No Parking" signs to the trees along the street so he could get those people into his $10 spots. We got in an argument over the fact that it was a public street and he couldn't stop me from parking there, but I eventually elected to park down the street so I wouldn't come back and find my tires slashed or a big loogie on my window. I might have called the police in that scenario for a multitude of reasons (or maybe parked and gone and grabbed an officer from the festival if they were willing). I think the best long-term solution for parking in the Paseo is to extend the streetcar there. Available parking for special events like First Friday and the Paseo Arts Festival is a legitimate concern as the area continues to fill in. However, a parking garage would ruin the feel of the neighborhood and I also don't think excess parking just for special events is a good idea. Extending the streetcar there would allow people to park in Uptown and ride it up to the Paseo if they didn't want to walk that far. Does anybody else agree? Didn't they have a shuttle running for the Arts Festival? This exactly. The Paseo would benefit greatly from a stop. But please, no addition mass parking in Paseo. I suppose a parking garage would work, with retail on the ground floor, off 23rd somewhere. But that's the only place I could advocate a parking garage in that area. Couldn't have said it better myself. structured parking would look very weird and out of scale and ruin the feel of the area. The walkable fabric in the paseo is exciting, human scaled, and feels authentically like the center of a neighborhood (which it is). Great places don't become great because of abundant parking! Yeah, A garage on the Tower theatre parking lot with retail on the ground floor would be the ideal spot imo. You'd think an urban neighborhood like this would be at the top of the sidewalk list... it's really, really bad along Walker between Paseo and 23rd. I agree with this. In fact, the Paseo area as a whole is badly in need of sidewalks. Much of the area either doesn't have them or has a lot of gaps. I personally am baffled why areas like the Paseo get passed over for sidewalks in favor of the outer burbs. I think it'll be great to add a parking garage structure behind the tower theatre. It gets crowded there every weekend! I love the idea of extending the car to Uptown; however, the sidewalks around Paseo are honestly very bad. Fixing those sidewalks are very important. I think the thing people need to start thinking about is that parking garages are not all bad. If they do decide to build one I think it'd be amazing, especially if it has retail at the bottom! Most of the damage to existing sidewalk is caused by massive tree roots. In my estimation, sidewalk replacement would be far more costly than normal, and pretty iffy for a lot of those trees. Not saying it shouldn't be done, just sayin'. That or the lot behind the Rise. The lot behind the Rise would make for a great garage. And if it had retail on the first level at least facing the back of the Rise and maybe Dewey, you could add a nice little retail corridor through that alley. Could be really cool if they ever did it. And then the sidewalks are non-existent on Walker north of Paseo. 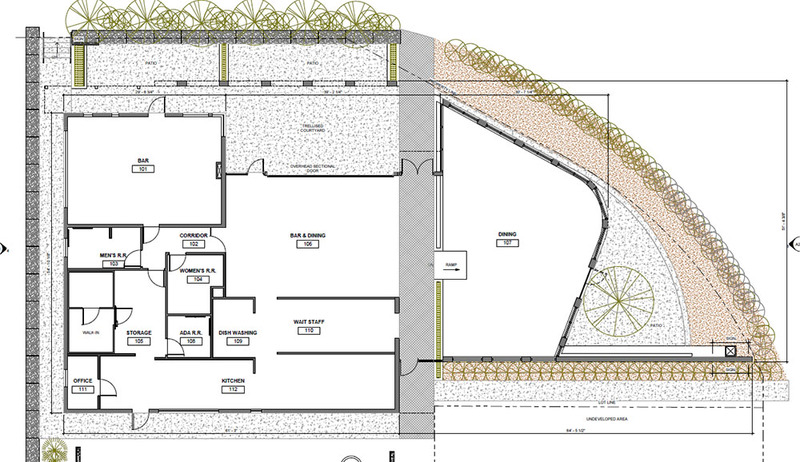 This project was approved today by design review.